I've embedded a Glogster which has the elements I talk about below. I was having trouble getting Glogster to accurately display, so here's a screenshot that shows all the elements (in case it doesn't work above). Ever since I took my first educational technology class last summer, I’ve been motivated to use the tools I learned in my own classroom. Even though I’m from a district that doesn’t have the latest and greatest technology, I have still found ways to incorporate into my lessons. Last fall, my principal approached me about teaching a Senior English “blended class” where students came to class three days a week and worked on their own the other two days. It would be the first “blended class” our district implemented. I was nervous and anxious to build a class around technology and literature. Since I’m implementing the first class, it has been a tremendous amount of work and responsibility, but has really motivated me to include technology in my classroom. One of my goals is to utilize the different technology tools, so I am able to apply them in the “blended class”. I will be setting the groundwork for all other classes that are taught like this in our district. I taught one section of the class this past school year, but still have a lot of things I can make better. My goal is to use what I learn to help me find new ways to improve the “blended class” and also ways to make my previous lessons better. Another goal I have is to help students feel more comfortable using technology. I think students really enjoy using technology, but are sometimes just as resistant to change as adults can be. Especially by high school, school has always been sitting in a desk and doing things with pen on paper. Technology opens up all new possibilities for learning. Now that I've been working so much with blogs I feel more comfortable teaching them. I want to have students create blogs to write their journals instead of how I have been assigning them in notebooks. I’ve also already started to create virtual final projects. 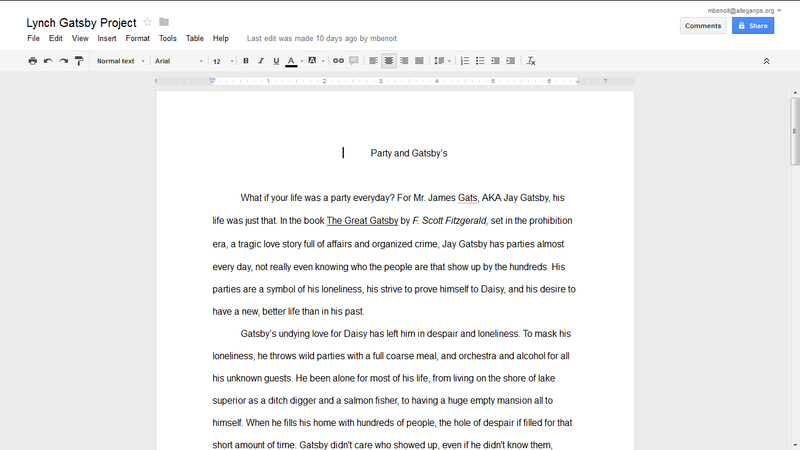 Instead of students making a The Great Gatsby project with normal supplies like construction paper and markers, students used the websites Edmodo, Mixbook, Google Docs, and Audacity to create an online versions. They enjoyed the process and still were able to analyze the book. I’m hoping I will learn more ways to show students learning and technology can work together. We often assume because students are surrounded by technology, they know how to do everything. What I found out when I was teaching the project was that students were not as technology savvy as I thought. Some of them didn’t know how to include an attachment, log in online, or even send an email. I want to change the way students see school assignments and also how they approach technology. I want the technology I’m incorporating to feel meaningful to them, so they embrace it. I also think by using technology, it will prepare them for life after high school. Even if they are not going on to higher education, most jobs require some interaction with technology. If I can get them to think critically about technology and how to approach it, it will be a valuable tool for them. "The blended class" is one way to do this because students have to be motivated and disciplined to do the work when they are not in school. It takes a lot of planning on my part to set up the assignments ahead of time on Moodle and make sure they have the resources to complete the work. Showing them tools they can use in the future will make them realize I really am trying to give them valuable resources. Hopefully this helps them find meaning in the assignments and in turn do a better job on them. 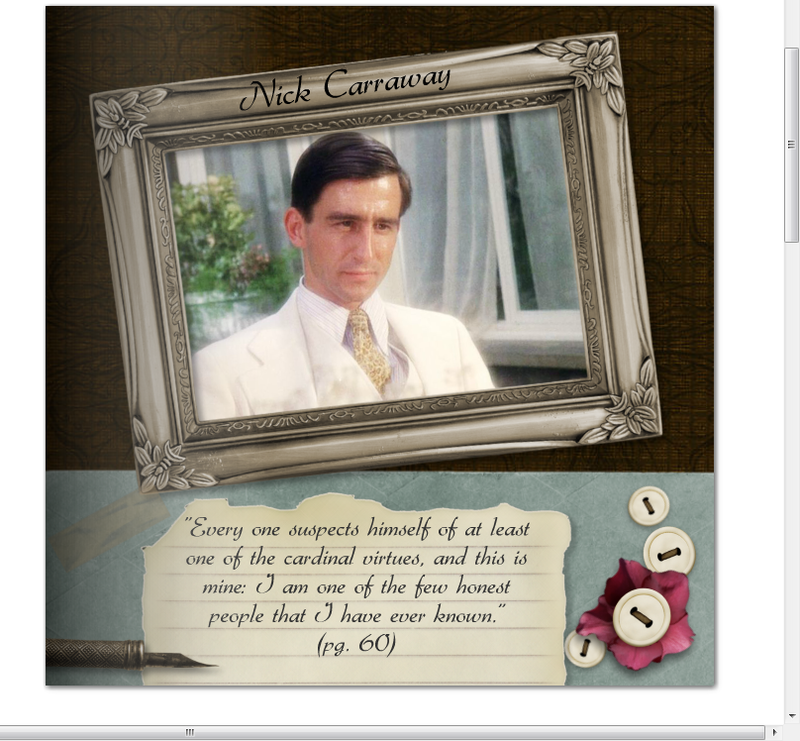 An example of Mixbook being used for the Gatsby project. A student using Google Docs to complete an essay. 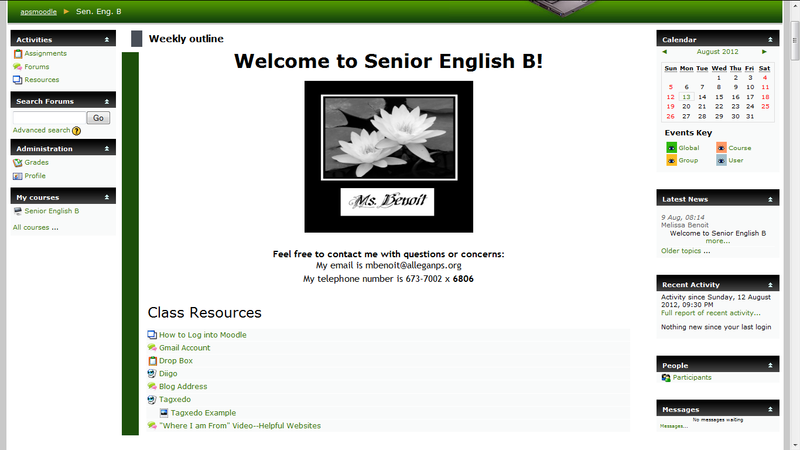 My class Moodle, which I hope to learn more about! Another one of my goals is to inform my colleagues and other teachers what they can do with technology. Often on Professional Development days our principal asks if anyone is doing anything in their classrooms (usually technology based) they want to share. This would be the perfect chance for me to share what I’ve learned. We also have monthly department meetings where I could share what I’m doing directly with the English department. Even something as simple as a Google Doc, where I could share it with the entire staff. By taking the tools from this class and using them in my own classroom, I can then take my knowledge and pass it on. Especially because I am teaching the first “blended class” I will be spending countless hours showing others how my class operates and what tools I use to create a meaningful learning environment. My goals are to take my knowledge from this class and make sure others have the opportunity to learn from me. I even think I can share and collaborate on assignments/ resources/ and tools with educators outside of the district. I hope this class allows me to learn and grow as a teacher, but also to make a difference in how my students learn and fellow colleagues teach.I'm already planning to show off my wiki at a PD day in January. 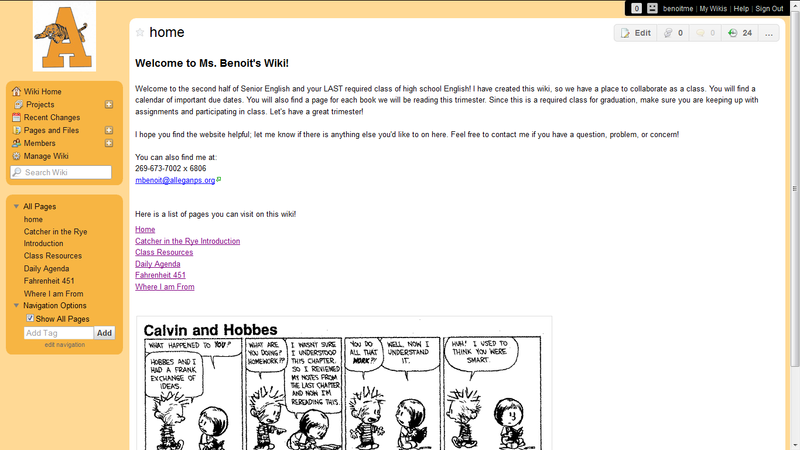 My class wiki that I'll present on our school PD day. Aside from just creating assignments using the tool, I think I can improve my technology skills by creating my own example of the assignment. It will give the students a concrete example to see and also will give me a chance to practice using the tool myself. I did this on one assignment I taught last year. My students had to make a Windows Movie Maker movie after they wrote a “Where I am From” poem. I wrote my own poem and then created my own movie. This allowed students to see all the aspects that were required (music, images, poem, etc) in a finished version. I was worried it might limit students creativity because I’d given them just a basic example, but I actually had more students go above and beyond. 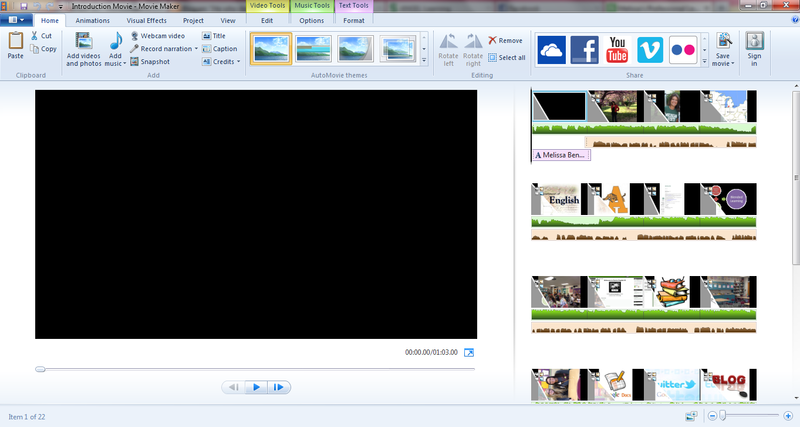 I realized that not only did I feel more comfortable using Windows Movie Maker after, but it helped my students. As I learn new tools, I want to continue to create my own versions to improve my technology skills. Another one of my goals is to use things like Google Docs, Twitter, a Blog, a Website, and other resources (instead of just paper and pen) to communicate with students. By using these myself, it will not only help me improve my technology knowledge, but hopefully help the kids as well. It will force me to try new things and also become better with the technology tools out there. Finally, I think one of the biggest goals I want to do to improve my technology skills is to work with other educators. I have embraced the collaboration aspect of this class because we all have really great ideas to share. I think hearing what others are doing will be what makes me really improve. It will also help me realize if it’s successful in another teacher’s classroom it can work in mine. It will force me to try new things and to really embrace different forms of technology. I also think it will help me gain the confidence to teach other educators. Knowing teachers will be coming to me with questions about the “blended class” and technology I am using in my classroom will be my motivation to improve my technology skills. I want to keep working hard and learning everything I can, so my technology skills improve enough to share with others. 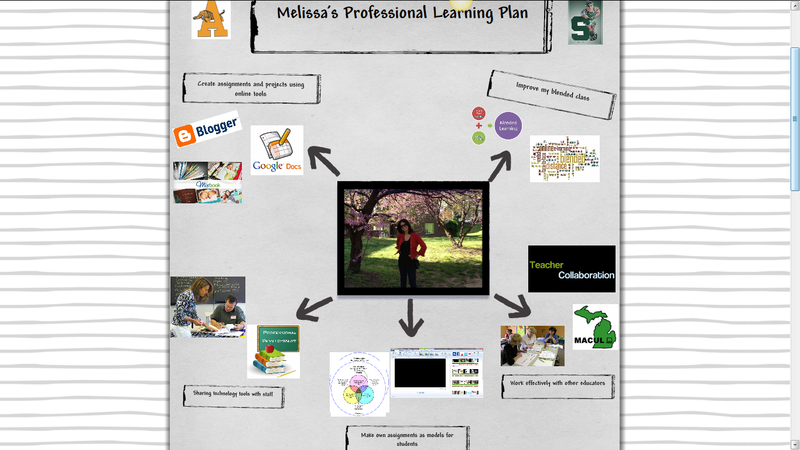 I will use websites like Macul, Twitter, and Nings and attend conferences to work with teachers outside my district. I am anxious to continue to learn the technology skills I need to not only help my students, but so I can be an asset to other educators. I plan to continue to take MSU graduate level classes. It will keep me up to date and working with other educators that share my passion. I also am on the technology committee at school. We recently got some bond money and are looking for ways to spend it. As a committee, we have been to various schools to see how technology is being utilized. I want to continue to stay involved in that and learn new tools for using technology. I also plan to attend the Moodle Moot conference that is being held in January through Macul and Remc. I think it will really help me teach my blended class and find new ways to incorporate elements into Moodle. I want to constantly make sure I'm finding innovative ways to use technology.